Enhance your yard’s appeal with an Emsco landscape rock! With its natural color, this artificial rock has a natural appearance that blends well with gardens, lawns, and landscapes. It’s natural-looking exterior also has a realistic texture that will add a feel of authenticity to your lawn. With dimensions of 16.5” x 20” x 15” (height x length x width), this plastic rock is easy to install and lightweight. Each rock has two stakes included to anchor the product securely to the ground. It is also lightweight, so you can pick it up and place it anywhere in your landscape. Each artificial rock is durable and resilient, as it is able to withstand extreme weather conditions. It has a high-density resin construction that displays a very sturdy and realistic-looking structure. Polymer-made, these rocks have two stakes included so that they are anchored to the ground and remain upright even against extreme thunderstorms and intense gushes of wind. This natural-looking rock can also be placed over wells, pipes, pump, sprinkler valves, and other fixtures to block them from sight, thus enhancing the aesthetic of the terrain. It can be used to cover up utilities in lawns, yards, or landscapes. It also accentuates the greens of lawns with its neutral surface shade. EMSCO has a complete line of boulders and stones available in their catalog. They offer rocks of various sizes, along with an assortment of detailed textured rocks. The list showcases a variety of colors, shapes, and sizes, so you can choose your preferred style to match your lawn and landscape needs. Decorate your landscape with only the best by using EMSCO Landscape Rocks! SEE ROCK DIMENSIONS PHOTO FOR BEST SIZE OPTION - The rock's overall dimensions are of 16.5" x 20" x 15" (height x length x width). Please keep in mind that the rocks have an irregular shape and are tapered. To determine the best size for your application, please review the rock dimensions photo showing variations in both height and overall footprint. NATURAL TEXTURE AND APPEARANCE - This architectural rock has a natural appearance that blends great with gardens, lawns, and landscapes! COVERS UP LANDSCAPE UTILITIES - The rock can be placed over wells, pipes, sprinkler valves, and other fixtures to block them from sight, thus enhancing the landscape's natural beauty. OTHER ARCHITECTURAL ROCKS AVAILABLE - EMSCO has a complete line of landscape rocks available. 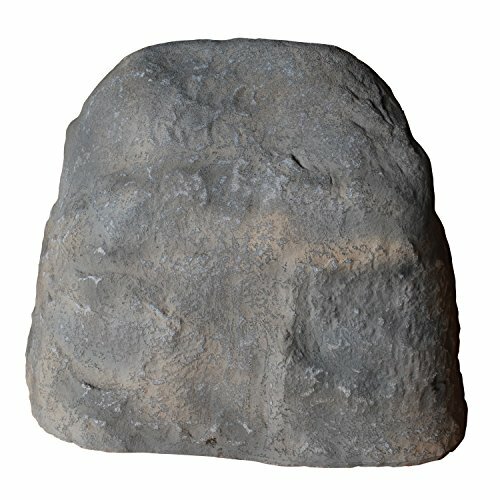 The rocks come in many different sizes, along with an assortment of detailed textured rocks. View More In Decorative Stones. If you have any questions about this product by Emsco Group, contact us by completing and submitting the form below. If you are looking for a specif part number, please include it with your message.